I keep reading Stuart MacBride novels, unintentionally. I had followed his Logan McRae books for a while, but then they got kind of… icky for my taste, and I dropped them. Then I read another, by oversight. It was OK. Now I picked up this stand-alone, A Dark So Deadly, by another oversight, and I was extremely impressed. This is a good novel, and a unique one. It starts out very like the Logan McRae books, following a long-suffering, decent cop through various humiliations. DC Callum MacGregor, a detective in the city of Oldcastle, Scotland, has been assigned to the “Misfit Mob.” That’s a squad where the department dumps morons, goldbricks, screw-ups, and the corrupt. Callum is considered one of the latter, after confessing to contaminating a crime scene in an important case against an organized crime boss. Everyone thinks he took a bribe to do it. In fact, he wasn’t even guilty. The mistake was really made by his girlfriend, another officer, and he took responsibility because she’s pregnant with his child and would have lost her salary at a time when they can’t afford it. We watch as Callum is severely beaten and bitten by a thug he’s trying to arrest, meanwhile having his wallet stolen by a couple feral street kids. His colleagues and superiors constantly insult him. Then he’s saddled with a new partner, a woman with a chip on her shoulder. As the day continues, things only get worse. When a corpse dumped in a land fill turns out to be a mummy, he’s frustrated, because that means it’s just a museum robbery case, not a murder. Until they discover that this mummy is not ancient, but recent. The victim was slowly starved, and then smoked like a fish. The mummy gets linked to the case of a missing young man, one of three. Suddenly it’s a kidnapping case, and the other missing men may be facing a horrible, lingering death. Meanwhile, the list of Callum’s accidents and injuries grows, and here’s where the story gets really interesting. Gradually, as Callum’s pains increase, they begin to attain the level of true suffering, and he transmogrifies into a kind of Job-like figure. He suffers a devastating personal loss just as he begins to realize that these serial killings are directly related to a crime in his own past – the decisive tragedy of his childhood. I genuinely enjoyed A Dark So Deadly. 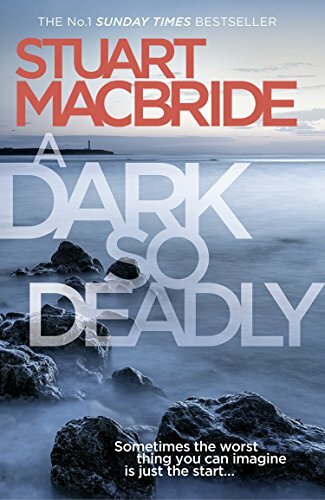 Author MacBride has achieved a literary effect I’ve never encountered before, and he kept my fascinated interest throughout. Well done. Recommended, with cautions for language and mature themes.